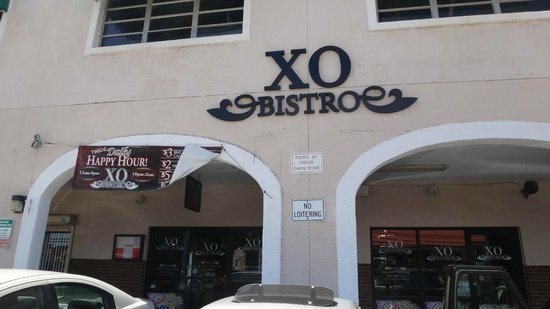 XO Bistro is a restaurant and bar in the most popular plaza of Red Hook, a secondary shopping district far to the east on St. Thomas, in the US Virgin Islands. 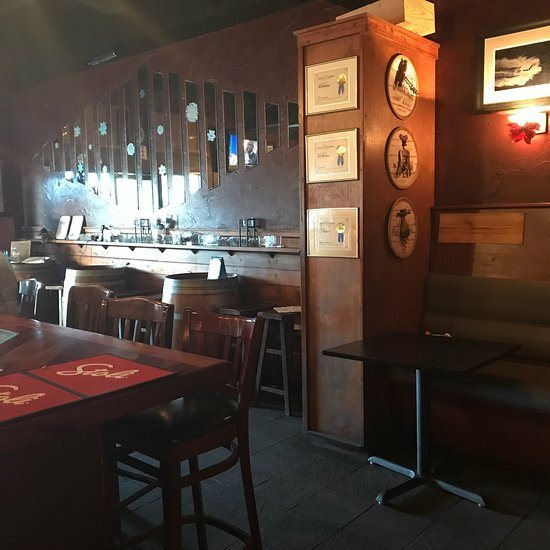 It’s set up like a bar, with the bar being the major centerpiece of the place, and with bottles of wine all over the walls of a dark wood design. However, it’s upscale, not dive-y, and they do have booths for dinner seating. The place was lit with low light, but wasn’t absurdly dark like some bars where you can barely see your friends. The music was low, so that we could easily talk over it. You’ll get giant glasses of water with a side of lemon, just what thirsty tourists need in the heat. Its booths for dinner looked recently purchased or well taken care of. They didn’t have the grease and scratch patterns you expect on pub bars, and the table settings were elegant with cloth napkins. 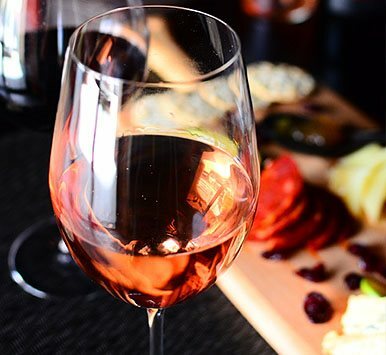 The menu at XO Bistro features daily specials and a wide variety of alcohol. For an appetizer, try the crab cakes, which come in a mustard cream sauce, the bruschetta, spinach and artichoke dip, or shrimp scargot. For a main course, get the lamb chops with feta mashed potatoes, the shrimp or tofu linguini, the crab topped mahi, or the American Pie Grilled Flatbread Pizza. We asked whether the XO Bistro was understaffed, noticing that servers doubled as bartenders, but were told that it is always like that. Even though they were busy, staff took a moment to chat with us and make us feel at home. That was impressive. Although we got plenty of attention from servers, our appetizers took longer to arrive than they should have, even on a Friday. The Cheese Board was the best cheese board of my life. It’s very decorative, served on an actual board, with crackers and prosciutto, with little apple wedges too. Delightfully, it comes with a tiny cleaver for the meat. The prosciutto is high quality, served room temperature, and thin. It’s not greasy or stringy. Although the crackers were ordinary, the cheese, the cranberries, the apple slices, were a delicious combination. The cheeses, of unknown type, were distinctive, rich, interesting, and creamy, with a good mouth feel. It was fun to chop up the meat and cheese with the cleaver, and layer it all on a cracker. 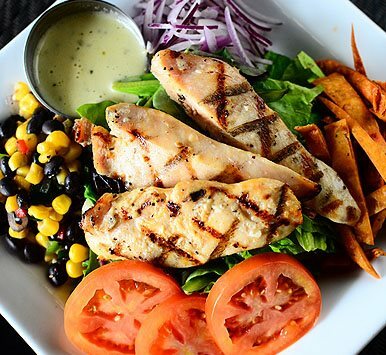 My favorite – wow! – was the extra sharp cheddar. It’s a good conversation starter to sample the different cheeses. A server noticed that we finished our crackers before we finished the rest of the cheese, and offered us some really hot, fresh bread. Wonderful. We also tried the Garlic Bread appetizer, which came served on a white long rectangle with a red sauce dip. We asked for the optional cheese, but should not have, because it masked the garlic flavor, making the dish less spicy than expected. The bread was toasted and crunchy, but not tough as garlic bread so often can be, where it might scrape your mouth. We got the Caprese Salad, which is also very decorative, one of the more interesting salad presentations I’ve ever seen. It’s an artistically laid out long white plate of alternating tomato and cheese, on a bed of lettuce with balsamic vinaigrette sprinkled on top. The lettuce was so fresh and crisp, and the balsamic vinaigrette had a real kick to it, being thick and not watery. The tomatoes were also remarkably fresh, with a little crunch. They offset the cheese perfectly, and you could cut into them without juices spilling. For entrees, we tried the New York Strip. It was more dense than expected, a bit too tough, with a little inedible fat in the meat. The asparagus though was delicious, and came properly cooked, including the top ends, with a delicious mushroom sauce. The pears were an interesting addition, but were also a bit dry and dense. We also got the Lasagna, served attractively on a round plate. It came with delicious garlic bread that proved that earlier we were right. We shouldn’t have had the cheese on our garlic bread appetizer. The lasagna meat sauce was interesting and complex, and felt hearty, with plenty of meat. It was slightly overcooked on one edge, but not overwhelmed by its cheese as lasagna can be, allowing its contents to dominate the taste. The Barbecue Pulled Pork Pizza was also served on a cutting board, pre-cut into strips. It came with hot jalapeno peppers, making it so spicy and interesting! While it might have been a touch too cheesy, the flat bread was no ordinary crust, and the onions were dark, with a strong barbecue sauce. Our server told us that they bake their own desserts in house, and that the desserts vary every two weeks. We tried the Raspberry Guava Cheesecake, served on a white rectangular plate with whipped cream. 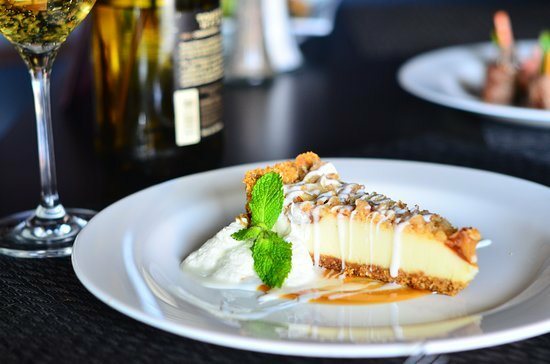 The crumb layer was excellent, thick and crunchy enough to offset to the smooth taste of the cheesecake top. It was sweet, but critically not too rich, just an excellent, delicious combination, with the whipped cream a cool down effect. Thankfully, the cheesecake was not too dry or tough, so that it was easy to eat without being overwhelming. The Tropical Pina Colada Cake was the only dish at XO Bistro we tried that was not for us, although we could sense that it might be for other people. The vanilla wafer on its top was soggy, as though the cake was not fresh, and it was sickly sweet, like a pineapple upside down cake. It comes in three dense layers, with a generous serving of whipped cream, and chunks of pineapple in her cake. In getting our leftover to go, we appreciated that the to-go boxes were paper not plastic or Styrofoam, so they could be directly reheated. Every dish at XO Bistro was imaginative and came with a unique twist, with several “wow!” moments and artfully presented. Its tastes were strong, as though they pay serious attention to the components of the dishes here. They’re putting the dishes together from excellently chosen and prepared components. The service was excellent as well. 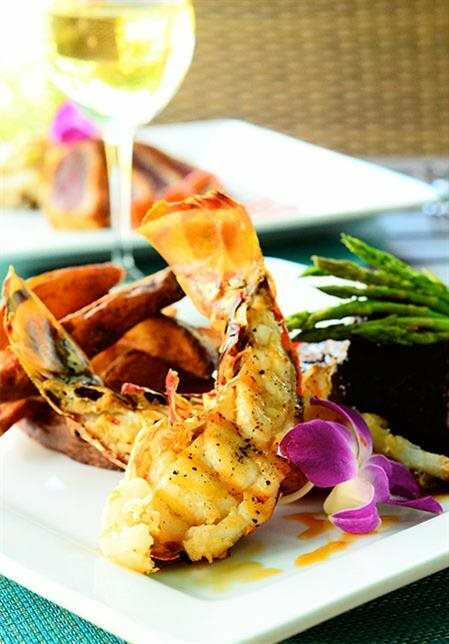 It’s a shame that there is no view at XO Bistro, on an island with so many ocean view restaurants, or it would be a contender for the best restaurant in St. Thomas. I’m glad to give XO Bistro a perfect 5 stars.